Born in Chicago, Nancy Whitman earned a fine arts degree from the University of Wisconsin. She followed this with a year of graduate study at the Chicago Art Institute and another extremely formative year in Paris, France.Nancy paints in an exuberant style, combining broad brush strokes and unexpected use of color. With her oil, acrylic and watercolor creations, she acknowledges the influence of Matisse, Jawlensky and the Fauves. The vigor and joie de vivre bursting from her canvases reflect her love affair with nature. 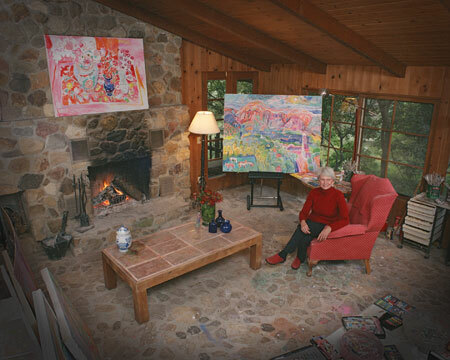 She paints amid the sheer beauty of her studio-gallery home in lush upper Ojai Canyon. Enormously versatile and varied in her expressions, Whitman communicates the feeling of magic and freedom of a child. A critic once said of her, “Her work is infused with warmth, joy and a mood of exhilaration.”A winner of many awards in juried competition, Whitman’s paintings are found in numerous private, public and corporate collections nationwide. Whitman’s documentation took place in 2003.